High Ashgill is a converted farmstead dating back to the times when the border was determined more by the raids of rieving families than by the wars between the rival crowns of England and Scotland. On the flanks of the South Tyne valley, with stunning views to the north, south and west, a more peaceful paradise would be hard to find. Watch birds of prey, red squirrels and the occasional roe deer during the day, listen out for owls at night - or marvel at the Milky Way and constellations of stars in a sky free from light pollution. What was once the byre, Cloud Nine has been converted into a self-contained wing with oodles of character and accommodation for four to six people. Are you looking for a venue for a day's workshop, seminar or conference for up to 16 people? "...you don't have to get in a car to go in a variety of beautiful directions, and the feel of where the house sits in the valley is immediately peaceful. I could really imagine it would be a good place from which a writer or artist could find new inspiration...It's well equipped too, kitchen-wise and entertainment-wise." High Ashgill is six miles south-east of Alston on the B6277 towards Middleton-in-Teesdale. It's a mile from the Yad Moss ski tow, and the last building on the road as it climbs out of Cumbria into Co Durham and Teesdale.  Or, of course, the first, as you come over from Teesdale into the South Tyne Valley! Whichever way you approach it, the views are as dramatic as the weather at these altitudes (1,500 ft /500m). The nearest village is Garrigill in the valley below, with its pretty collection of houses clustered around the village green, and where the landlord of The George & Dragon serves-up generous portions from a wide menu and a fine selection of wines and real ale. Garrigill also has a Post Office and village shop. The oak seat around the tree on the green is a much-sought-after resting place for walkers and cyclists as this is a convergence of the Pennine Way, the South Tyne Trail and the C2C cycleway. 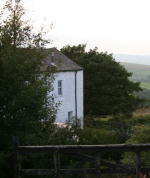 Nobody seems to know when the oldest part of High Ashgill was built. However, the newest part  the farm house attached to the south-east end  was built in 1711, so it's safe to assume that most of the rest was there more than a hundred years' earlier. The barn was used as a mine shop, complete with a sleeping platform, by part-time miners who would return to their own small-holdings. Cloud Nine has its own entrance and off-road parking. We provide a Welcome Tray for your arrival. Bedding and towels are supplied. Sleeping accommodation comprises a double and a twin room, both with wash hand basins, and a bed/settee in the living room. The open-plan living area is an ideal place to relax by the stove, either with its doors open or closed for added safety. Or you can move the furniture back, bring out the full-sized table tennis table, and run your own tournament! There's also a minature table football set and a selection of board games and books. With a satellite (freeview channels) TV/DVD player and a radio/ CD/ cassette player, you can occupy your every waking moment. There is also a desktop computer available. The fully-equipped kitchen area includes a fridge (with ice-making), an electric oven and gas hob, micrwave, electric kettle, toaster, and enough pots, pans and utensils to keep most cooks happy. The family bathroom has a WC, bath with shower, radiator/towel-rail, airing cupboard and wash hand basin. Water is solar-heated, which means that in the summer it is usually all that's needed, but in winter needs a boost from an immersion heater. The water supply is fed from a spring high on the fellside, and shared by all our neighbours. It never runs dry, but after heavy rain it sometimes becomes peat-coloured (some say we should take to distilling whisky...). We hope you will appreciate that we try hard to maintain a low carbon footprint. We use low-energy light bulbs, solar heating and a small wind generator. We re-use and recycle wherever possible. We can provide access to a clothes washer and a tumble drier (although we discourage use of tumble drier, and can provide an old-fashioned wooden drying horse for inside, and a clothes drier outside). Space heating is by storage radiators and a multifuel stove (coal and wood supplied). Electricity included. You can enjoy the use of the garden to feed the midges on any exposed flesh if the wind is below 3mph (not often), or for a barbeque. We offer no regular arrangements for children and babies, but can do so if requested.